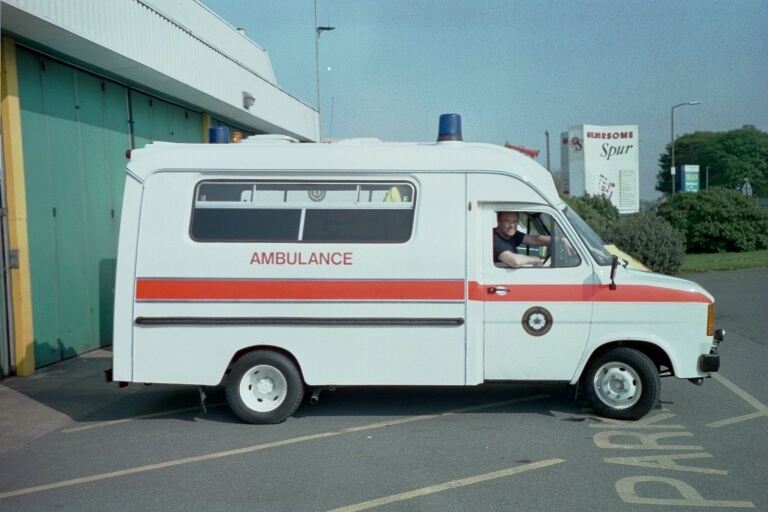 The 3 litre six cylinder Ford Transit “Hanlon” Ambulance was delivered to the West Yorkshire Metropolitan Ambulance Service (W.Y.M.A.S) on the 2nd August 1982. It spent most of its life, working out of the Gildersome Ambulance Station. It was sold on to a private buyer at local auctions and partially converted into a mobile home in 1992. After 3 years as a mobile home, the vehicle was retired to a dismantler’s yard in Dewsbury. It was later recognised by an ambulance man by the registration number, as one he used to drive. It was hardly recognisable though, it was painted deep red, the windows boarded up, there were holes in the wings, a cracked windscreen and the doors were rusted through. Due its condition, it was bought for £75.00, a bargain! 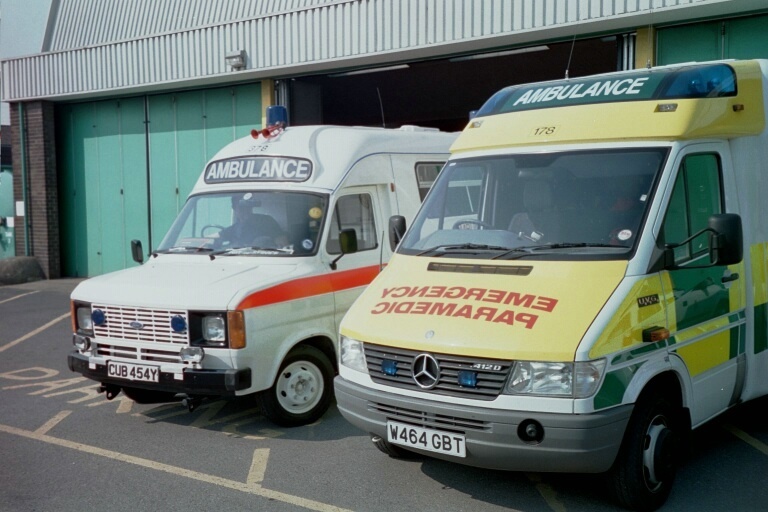 It came back into service with Dewsbury Ambulance Charities on 29th June 1995, as a Flagship vehicle for the Charity. It’s fleet number was 378 and it was one of the last batches of Ford Transits to work for W.Y.M.A.S. It was much loved by ambulance crews that worked on it. In time the fleet were replaced by other makes, such as Bedford, Renault and later Mercedes. 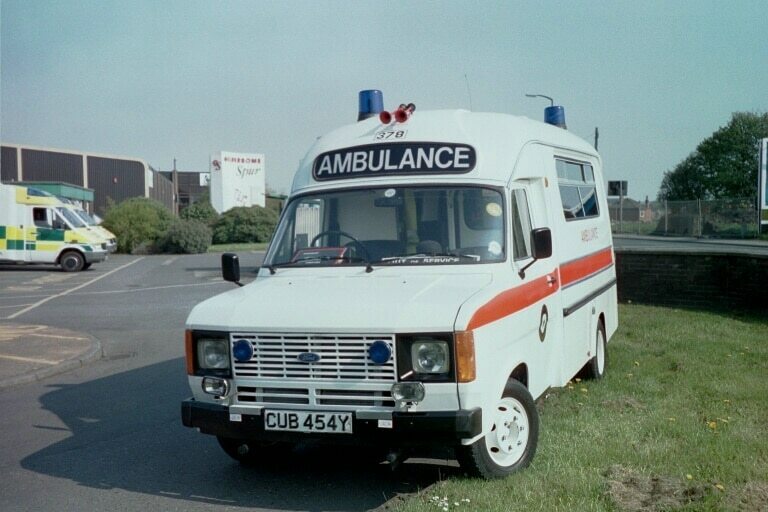 The old style ambulances were sadly missed by many. Fortunately for the restoration team, there were plenty of old equipment and parts lying around, at various ambulance stations. Our enthusiastic group were able to salvage, repair, adapt as much as possible. Within a year and with thanks to the voluntary efforts and memories of ex-colleagues who had worked on the transits our “Flagship” was back on the road on 21st June 1996. She is no longer available for 999 calls, but enjoys her life, on slow sedate outings, to galas, historical rallies and Dewsbury “Flag Days”. The ambulance goes by the nickname of ‘Cubby’ due to its unique registration number (CUB 454Y). Dogs Bodies : David Deaves / Tony Chatham / Mick Almond / Bob Glover. Some members of the restoration team, have since sadly passed away, but their memories live on, in our flagship vehicle ‘Cubby’. Please see the gallery page for further pictures of the vintage ambulance. The Ambulance is available for hire. For details, contact David Deaves.